"For the week ending May 29, notebook sales accounted for 56 percent of the entire U.S. personal computer market, according to figures from Current Analysis." "That's the first time notebook sales have been higher than those for desktop PCs...."
"Fujitsu has developed a 100 GB hard disk drive suitable for use in notebook computers and has begun mass production of the drive. "The Tokyo company began manufacturing the drive in late March and its entire initial output has been snapped up by notebook makers, says Joel Hagberg, vice president of marketing at Fujitsu Computer Products of America. Now the company is beginning to accept orders from more notebook makers, and so is announcing development of the drive, he says." "Fujitsu's hard drive, the MHU2100AT, 4200 revolutions per minute rotational speed and comes with a parallel ATA interface, Hagberg says. "Toshiba said in April it plans to ship a 4200 rpm drive in the third quarter. Last week, Seagate announced two 100 GB 2.5-inch drives as part of a new lineup of products. Seagate plans to introduce a 5400 rpm drive during the third quarter and a 7200 rpm drive during the fourth quarter, according to the company." "Cincinnati resident Steve Philips is noticeably more excited about his recent switch from Windows-based PCs to Apple computers than his recent conversion from atheism to Christianity. Philips, an account manager for Choice Communications, was baptized shortly after his conversion and is in contact with Apple computers as a potential candidate for the company's popular 'Switcher' ad campaign. "...Philips also cited moral reasons for the changes, specifically the fact that millions of people are victimized by Microsoft's poor security, and the company knowingly sells a faulty product. "Coworker Dave Wilson was surprised to find that Philips was a new Christian. 'What, Steve, a Christian? I had no idea. But I guess it would be pretty easy to miss, what with him shoving that stupid PowerBook in my face four or five times a day. Geez, I wish he'd just leave me alone and let me live my life the way I want to.'" 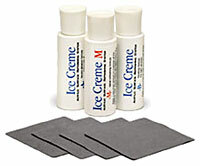 Ice Creme allows you to expertly remove the scuffing, scratching and abrasion which tends to occur on highly polished acrylic panels, like those used in several consumer devices and computers. Products like the iPod, iBook, PDAs and cell phones can all benefit from the ease of use and power of Ice Creme, which makes scuffed-up plastic products gleam like new. Great when you want to spruce up or sell your gear. Does require some elbow grease - a typical, moderately chewed-up iPod requires approx. 30-45 minutes to restore. The regular formula is for plastic products. The "M" version adds an additional bottle of metal polish for products like the iPod's polished, bright metal back panel. Not for use on painted or anodized surfaces. Both versions include special application and polishing cloths. "M" version adds metal polish to remove damage from iPod's metal back pan. Enough to restore several iPods, or 1-3 iBooks. PowerSleevz are formfitting, deluxe sleeve cases that insulate your PowerBook G4 or white iBook from life's little hazards. PowerSleevz notebook cases elegantly protect the exterior finish of your computer from all of life's little bumps and grinds. Made from a heavier-gauge version of Optex fabric, the case stretches on like a glove, hugging every curve. Extremely lightweight, flexible and durable - like the popular ScreensavRz - the case weighs just 40 grams! This case folds up small enough to easily fit in your pocket. Protects exterior painted finish of PowerBook G4 and the iBook's polished plastic from your larger case's zippers and hardware - or anything else lurking out there. A great, hassle-free tote when you need to take just the 'Book. Elegant debossed "PowerBook" or "iBook" text on one panel. Offers significant protection - PowerSleev'd notebooks have survived incredible perils. FlyLight USB PowerBook Light, Shine some light on a darkened keyboard. Price: $20.99. Universal Car/Air Power Adapter, Portable power for PowerBook or iBook, in the car or on the plane. Price: $77.95. The Think Different Store is giving away two Exhibit Guest Passes to the July Macworld Expo every day. Compliant with Win 98SE, ME, 2K, XP, Linux (check your distribution for drivers), and Mac OS 9.x (1394a only) or higher, FireWire Depot's FireWire 800 CardBus adapter provides end users and system integrators a unparalleled feature and performance. "Researchers have observed a new type of liquid crystal - long theorised, but not observed until now - that promises faster and cheaper liquid crystal displays. "This new crystal phase has the potential to speed the refresh rate a further ten times, the researchers say, as the crystals reorient more quickly in response to a voltage..."
Crucial Technology has introduced the Crucial Gizmo! Hi-Speed USB flash drive, a faster, slimmer version of the original Gizmo! USB flash drive. The Gizmo! Hi-Speed USB flash drive utilizes the Hi-Speed USB interface, which supports data transfer speeds up to 480 megabits per second (Mbps). The updated dark gray case is only 66.5 mm x 16.5 mm x 8 mm; small enough to allow multiple drives to simultaneously plug into neighboring USB ports. * A hole in the base allows the Gizmo! 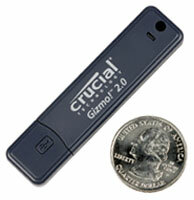 drive to fit snugly on a key chain, and a green LED indicates when data is being transferred. Included security software provides data encryption and password protection. "The Crucial Gizmo! Hi-Speed USB flash drive is a powerful, portable, and versatile storage option perfect for today's mobile lifestyle," said Crucial Technology General Manager Fred Waddel. "Whether you need a Gizmo! drive to shuttle data between multiple computers, or to act as a mini hard drive to store important documents or images - it beats using small-capacity floppy disks or a one-time use CD." A true Plug and Play solution, the Gizmo! drive automatically appears as a removable drive when plugged in to the USB port of a desktop PC, Macintosh, or notebook. Each Hi-Speed Gizmo! drive comes with a key ring, lanyard, multilingual user guide, limited lifetime warranty, free second-day shipping (for a limited time only) within the contiguous U.S. on qualified orders, and Crucial's renowned customer service and free technical support. The Crucial Gizmo! 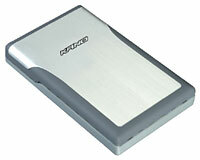 drive is available on Crucial's Web site in capacities of 64 MB, 128 MB, 256 MB, 512 MB, and 1 GB. Pricing currently ranges from $28.99 to $229.99. Providing up to 80 GB of portable data storage in a pocket-size solution, the SureFIRE800 is the ultimate storage tool for the mobile Professional. With the available FireWire 800, FireWire 400, and USB 2.0 combo connection, SureFIRE800 is compatible with most Windows and Mac systems. Simply drag and drop data to the SureFIRE800 and carry all of your data with you and access it from virtually any computer. With its plug and play data connection and bus power capability, installation has been designed to be quick and easy. In case of laptop system failure or theft, protect against the loss of critical data by backing up important data files to SureFIRE800 - just plug and go. Storing data on the go has never been easier or faster! With the available FireWire 800 interface, achieve data transfer rates of up to 800 Mb/sec. Boasting hard disks with 5400 rpm and 8 MB cache buffer, SureFIRE800 has speeds matching those of storage drives three times its size. With its ultra-fast interface and matching high performance disk drives, the SureFIRE800 makes accessing video, audio and data backups quick work. The SureFIRE800 is the perfect storage solution for creative professionals living the mobile lifestyle. Compact, portable and high speed, all in one. Compact 0.75 x 3.25 x 5.25"
High speed drives with 5400 rpm and 8 MB cache. Leading the latest DV and storage technology is FireWire Depot's DFB-804 3-Port repeater/hub for FireWire 800/1394b device. The DFB-804 hub/repeater is designed to extend and expand the FireWire 800 interface with additional ports and longer cable distance. Backward compatible with FireWire 400 (1394a) devices, the DFB-804 1394b hub/repeater is the best investment for DV and storage connectivity.